Sheryl Gabram-Mendola, MD, MBA, surgeon-in-chief at Grady Memorial Hospital and leader of the Avon Comprehensive Breast Center, serves as principal investigator of the grant. Investigators at the Glenn Family Breast Center at Winship Cancer Institute are the recipients of a one-year, $750,000 grant from the Avon Breast Cancer Crusade Board of Managers. 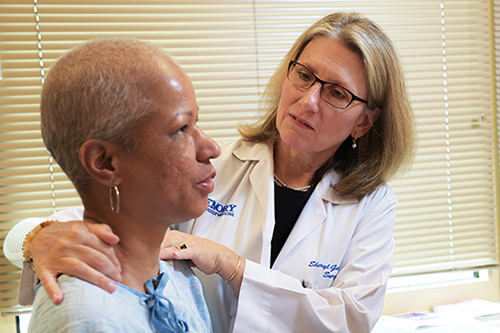 The grant will be used to continue outreach in breast cancer education and clinical access to minority women in underserved communities in Atlanta. Sheryl Gabram-Mendola, MD, MBA, surgeon-in-chief at Grady Memorial Hospital and leader of the Avon Comprehensive Breast Center, serves as principal investigator of the grant. Mylin Torres, MD, director of the Glenn Family Breast Center is co-principal investigator. "The knowledge gained from our Avon grant will be used to help women fight breast cancer who would otherwise not have access to high quality care in our local communities," says Gabram. "Through our research endeavors we hope to improve the care of women, regionally, nationally, and throughout the world."